“While Charles & Ray were frequently contracted by corporations like Polaroid, Westinghouse, and IBM, they never made films on demand. Nearly all their films represent a symbiotic relationship between the artist and the client, and they only made films when there was genuine interest. Witness Westinghouse ABC (1965), which is essentially a montage of the Westinghouse product line (note that the Westinghouse logo was designed by Paul Rand). Even here there is a spirited interest in the subject. In the film, Charles & Ray focus on the technology and typography at a break-neck tempo and transform what would otherwise be an incredibly dry subject into something rich and lively. 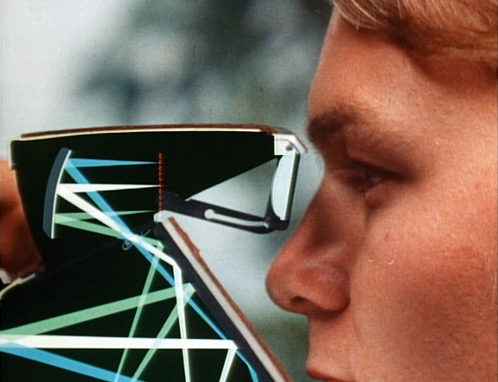 Also, in SX-70 (1972), intended as a promotional film for the newly released Polaroid SX-70 camera, the Eames’ take advantage of the opportunity to discuss optics, transistors and to display their own polaroid photographs. A good overview via The Films of Charles & Ray Eames.